The University of Colorado was created in 1876 by action of the state Legislature and opened its doors in Boulder in 1877 with 44 students. The Boulder campus is now the flagship of a system including campuses in Denver, Aurora, and Colorado Springs. 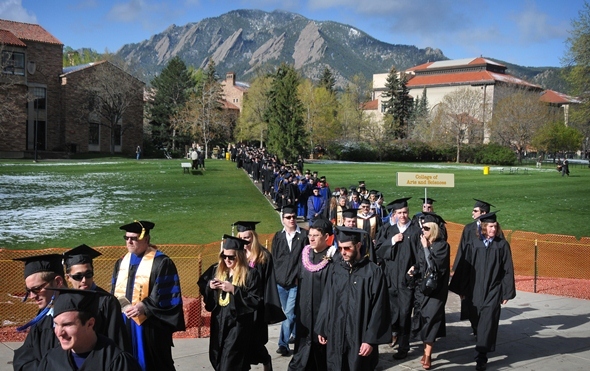 More than 30,000 students are enrolled on the Boulder campus, the only university in the Rocky Mountain region that belongs to the Association of American Universities. The campus is recognized as one of the most beautiful in the United States, nestled against the foothills of the Rockies, with the Flatirons rock formation as a scenic backdrop. Its style of architecture, Tuscan Vernacular Revival, features Italianate sandstone buildings with red tile roofs, although some of the older buildings represent a more traditional style. The campus’ look was developed by architect Charles Z. Klauder, and Sewall Hall is considered his strongest work. • Old Main, the first building on the campus, finished in April 1876. Old Main housed the whole university atop muddy University Hill. On its third floor is the university’s Heritage Center, which gives visitors a look at the history of CU, including academics, athletics and excellence of all kinds. LEGO-rado, a model of the campus made from LEGO bricks by engineering students, opened in 2014 and will be updated periodically. • Norlin Quadrangle, center of the old campus and a National Historic District, surrounded by some of the university’s oldest buildings. At its center is Norlin Library, named for the former CU President George Norlin. • The University Memorial Center, or UMC, is a student center visited by 14,000 people a day. It serves as Colorado’s official memorial to war veterans. It houses an art museum, the Glenn Miller Ballroom named for the CU alum and noted big band leader, and the Alferd Packer Restaurant and Grill, laughably named for Colorado’s only convicted cannibal. • Folsom Field, the 50,000-seat stadium where the Colorado Buffaloes play football. Originally built in 1924, on fall Saturdays it is the scene of probably the most interesting live mascot possessed by an NCAA team – Ralphie the buffalo. Ralphie V is transported to the stadium in a trailer and runs out onto the field before each half with a team of handlers, circling the field and often putting a scare into members of the opposing team. The field was named for Fred Folsom, a legendary CU coach. • Folsom is also the setting for Boulder’s Fourth of July fireworks display and is the end-point of the annual Bolder Boulder 10-K race. The first Promise Keepers gathering for Christian men was held at the stadium in 1992. Folsom has hosted several rock concerts, as well. A 1977 concert with Fleetwood Mac, Bob Seger, Firefall and John Sebastian exceeded any football crowd with 61,500 in the stands, and the Rolling Stones packed in sell-out crowds in 1978 and 1981. The Dave Matthews Band recorded its Live at Folsom Field album there in 2001. • The Museum of Natural History contains millions of specimens in the fields of biology, anthropology and geology, including fossils, animals of the Rocky Mountain region and relics of ancient Southwestern peoples. • Fiske Planetarium, seating 212, is said to be the largest such facility between Chicago and Los Angeles. Science on a Sphere in the lobby, showing Earth and other planets on a huge white ball, captivates audiences, as do star shows, laser shows and other presentations. • Sommers-Bausch Observatory, next to the Planetarium, houses research-caliber telescopes for faculty and student use but is open to the public on Friday evenings and for special events. • ATLAS, the Alliance for Teaching, Learning and Society, houses facilities for arts and technology collaboration, including classrooms, performance space and broadcast production space. • The Visual Arts Complex, completed in 2010, houses the department of art and art history, as well as the CU Art Museum. The 9,000-square-foot museum houses permanent collections and visiting exhibits as well as a video gallery. • Mary Rippon Theater, home each summer to the Colorado Shakespeare Festival, an outdoor theater completed in 1939 and named for CU’s first female professor.